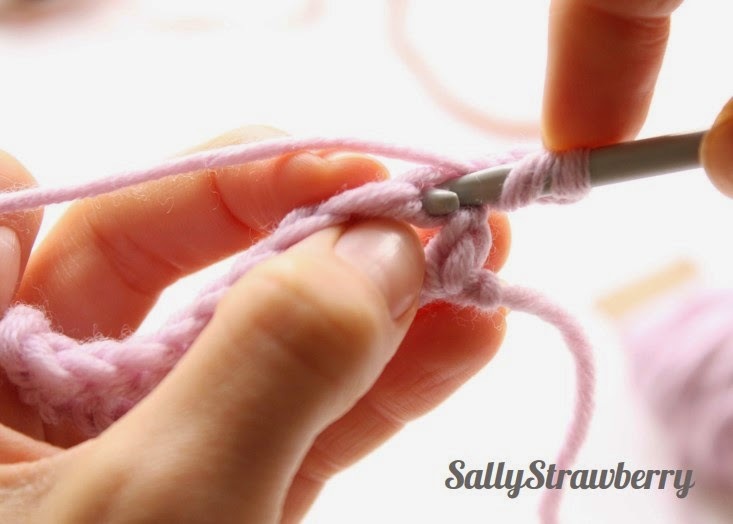 Welcome back to my next installment in my beginners 'Learn to Crochet Series'. If you have not seen my previous posts in this series do check them out (for one they may answer some of the questions you may have). 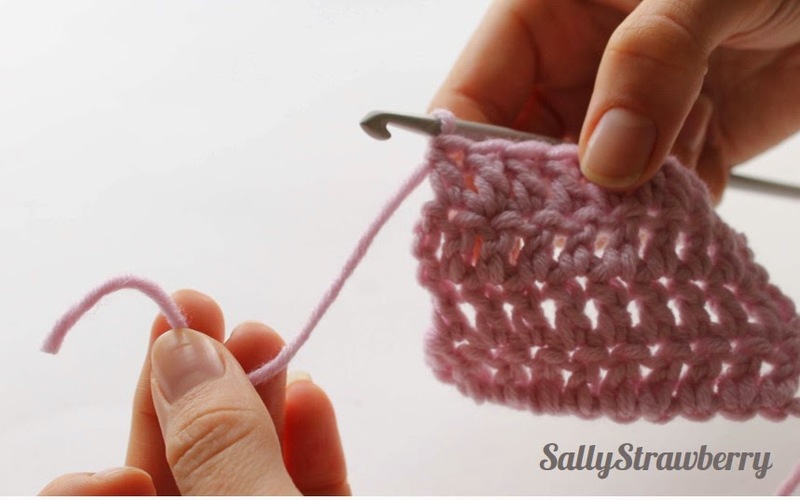 This is the final installment of a 3-part post into the three most common crochet stitches, the double crochet (US single crochet), the half-treble (US half-double crochet) and the treble (US double crochet). 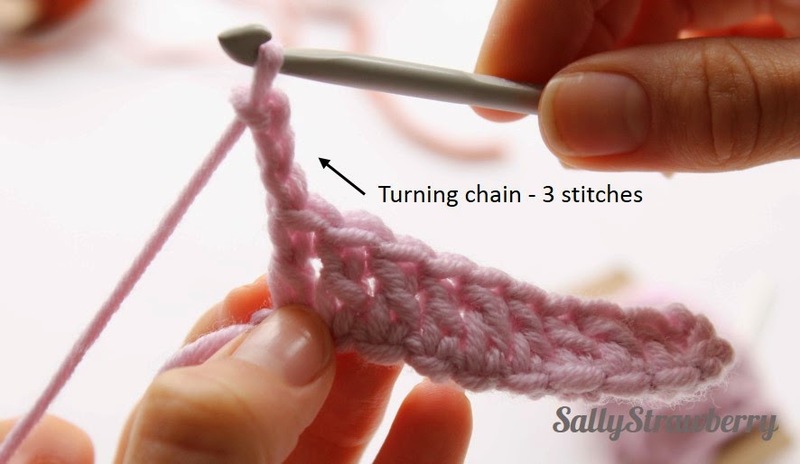 This post is focused on the UK treble crochet stitch, abbreviated to 'tr' (which in the US is called a double crochet, abbreviated to 'dc'). As you will see in the last picture in this post, rows of double crochet give a fairly loose fabric, with quite a bit of stretch. 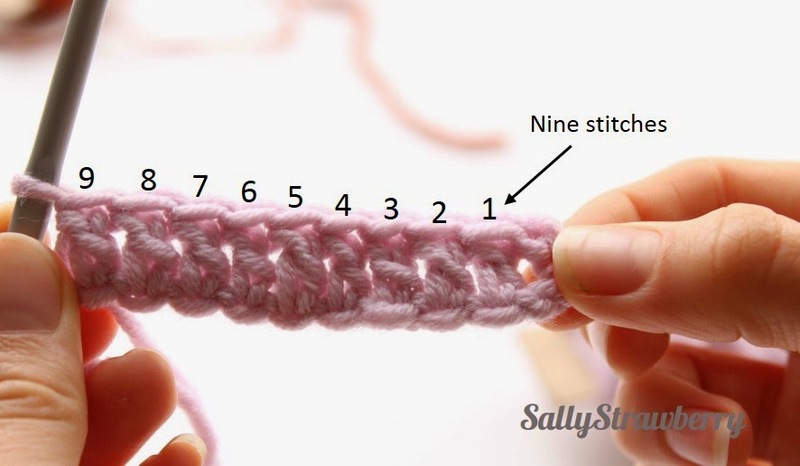 Treble crochet is suitable larger projects as crochet using this stitch grows very quickly, but where you are looking for a stretchier, more gappy stitch. I wouldn't use the treble for hats as I think it stretches too much, nor would I use treble stitches if I wanted to create a solid piece of fabric. The most common use for treble crochet stitches is for granny squares, the tutorial for which is set for release next week. 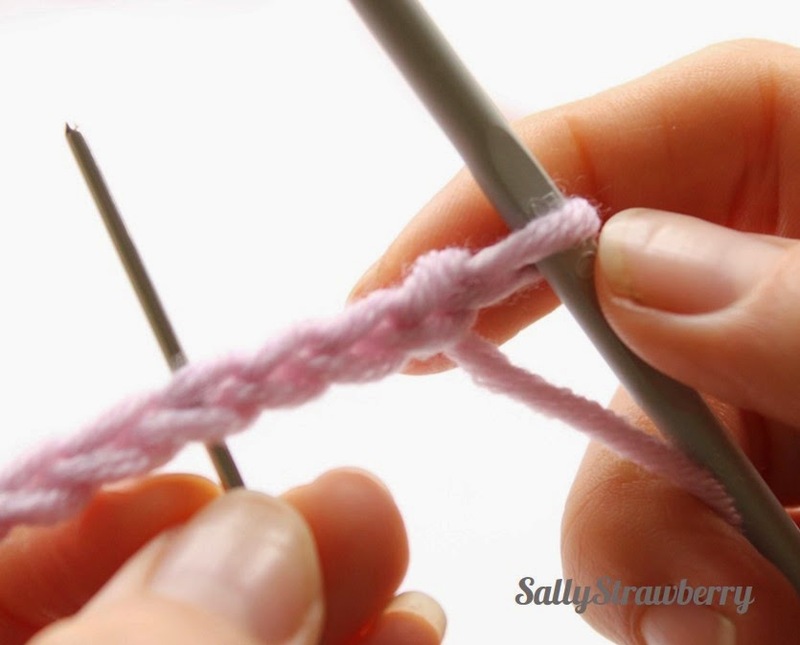 To start a row of treble crochet you need to crochet a length of chain stitch. If you don't know how to do this, see this post. Here I have crocheted 12 chain stitches. You will then crochet into these chain stitches to form your half-treble crochet stitches. chain from the hook, as shown by the needle in the image below. These 3 chains at the beginning of your row do NOT count as a stitch. 1. Wrap your yarn over your hook ('yarn over' in crochet speak) and insert your hook into the third chain stitch (either under one or both 'V's of the chain stitch- see the double crochet tutorial for more guidance on this), wrap your yarn over the hook again and pull through the chain stitches. 3. 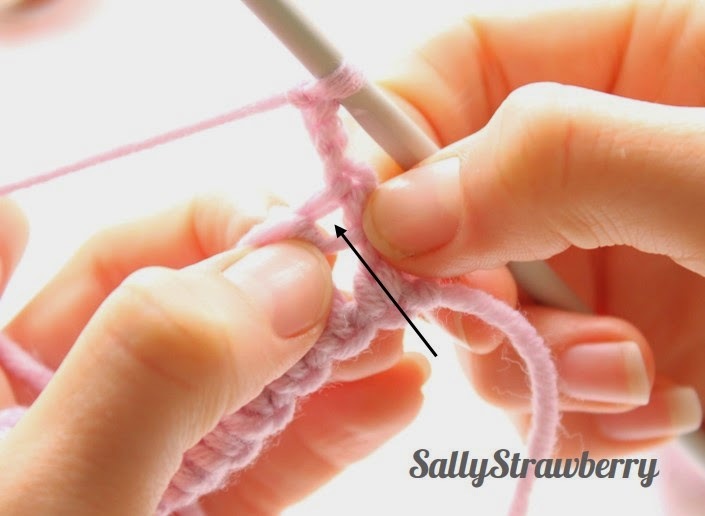 Yarn over hook again and pull through the first 2 loops on your hook, leaving 2 remaining loops on your hook. 4. 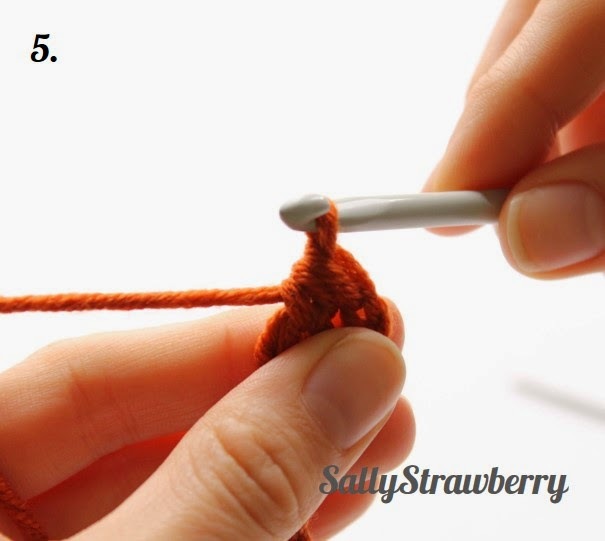 Yarn over hook again and pull through the remaining 2 loops on your hook. 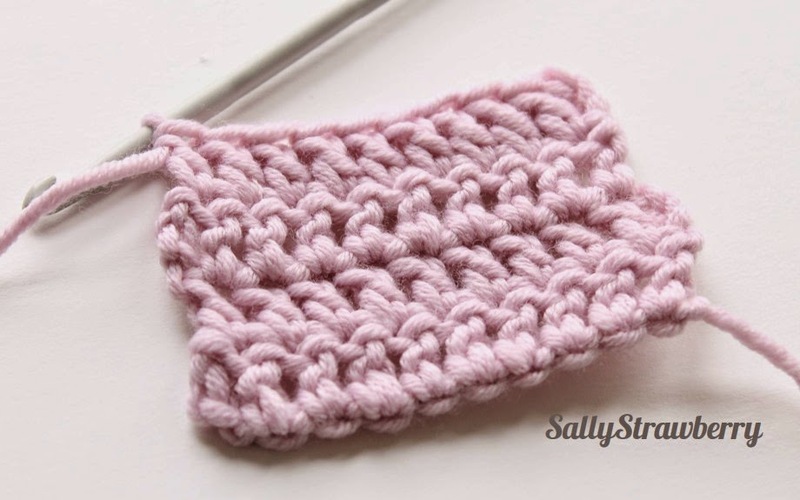 You have made one treble crochet stitch! Repeat steps 1-4 until you get to the end of the chain. You will have made 9 treble stitches. Now all you need to do is crochet a few more rows! First you must remember the turning chain. This ensures your piece of crochet will be straight at the ends. Follow steps 1-4, to complete your next row. Crochet, chain, turn, repeat.